Lesley is known for inspiring minds in her Early Education Program, Prenatal or her Doula and Reiki Training Facility. Placenta Art is Quite Beautiful right? 8.2K total views in Klusster. Join Klusster now and reach more people online! Red Tent is a space women gather to tell their stories, laugh, cry and celebrate themselves again. We are collective of professionally trained women who only participate within evidence-based standards of practice. It is our strongest wish to assist women as they make their way through their life's journey. We validate our clients by listening as they tell their story. Red Tent - what is it? This seems to be my recurring question when someone new hears about or is invited to a Red Tent. "A Red Tent is a space, where women gather to tell their stories, to laugh, to cry and to celebrate themselves again"
As little girls grow into women they have a habit of losing themselves to become what others expect from them: wife, mom, sister, grandmother, friend, teacher, student. These different hats we wear can all have different expectations. Personally, I learned of the Red Tent a few years ago from an incredible women Tiffany Lazic owner of the Hive and Grove. Tiffany taught a wonderful course on becoming a Red Tent Facilitator that I took. Tiffany created a spark, a fire within me, on how we can support other women in our families, circles, community and globally. Additionally, she lead me to the documentary “Things We Don’t Talk About by Dr. Isadora Leidenfrost." If you have never seen this documentary, I highly recommend it. 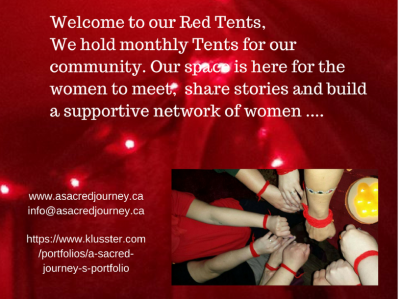 At A Sacred Journey’s Red Tent, we usually share time and stories. We have explored with henna, self-care activities, created stepping-stones, dream catchers and more. Really, these activities are about utilizing the tactile hands on activity while collectively we break down the barriers we have built up for self-protection. Together we have created a space where women from all socio-economics, academic, and religion can meet and find a way to, not only accept each other; value their sisters and their views. 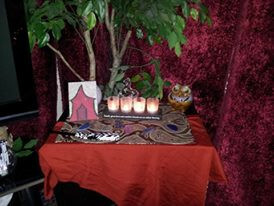 We asked some of the ladies of A Sacred Journey’s Red Tent what they think about the Red Tent. First I will share with you what I love about the Red Tent personally… I LOVE the community, my dear sisters, and unconditional support. Below are the answers to a simple question I asked. I said, I am writing an article, and would like to share what do you like about the Red Tent. However, I have to say before you read their answers is ALL of these came in within 15 minutes of me asking the question. That in and of itself says something! "I like the feeling of sisterhood. Of feeling welcomed and accepted unconditionally. A sense of finding oneself through shared experiences and memories. It is a place where a woman can share what makes her special, her skills, her life, her loves, where she can learn and grow with the help of others. It is a celebration in the life we live and our place here on Earth and in the universe." "In the Red Tent, a woman doesn't have to be a mother, a daughter, a sister, or a wife; she can just be herself, for the sake of being herself. We take so little "me time" in today's rushed world, that this gives us a couple hours a month to take care of our own needs." In completing this article on a Red Tent, please know, my sisters are my support team; they cheer me on like no one has ever done in this world. I could never have made it through the past few years of my own personal struggle without each and every one of the women, sisters of A Sacred Journey’s Red Tent. I love you to the moon and back…. I would also like to thank Klusster and the team at Thrive Collaborative for giving us the opportunity to share our passion for the Red Tent and indeed we are grateful to be a part of something that helps other women THRIVE. If you have a question or comment you can reach us quickly by clicking on the button below Send Me A Note and write us a note. We will respond quickly. As beautiful it is, the safety steps are truly important, especially where you are a teacher. There is far more to natural remedies then just scent. Essential OIls are very healing.